Imran Khan is set to be Pakistan’s prime minister. Amid allegations of rigging, Khan’s PTI has an unofficial lead in the race for parliamentary seats. Vote counting in an election marred by allegations of fraud and militant violence has been tediously slow, yet from the outset cricket star Imran Khan and his party have maintained a commanding lead. As Pakistan braces for the general elections on July 25, more than a hundred parties are taking part in the process. But who are the key players? Pakistan is a flawed democracy, but its shortcomings should not lead to a dismissal of the country as a 'failed state' or an intrinsically undemocratic one. Pakistanis are demonstrating that the arc of Pakistan's politics, bends towards democracy. Pakistan elections: how does it all work? More than 105 million Pakistanis are eligible to vote on July 25 for a new lower house of parliament, and, in doing so, usher in a new prime minister – an office whose term no elected representative has been able to complete. Pakistani former star cricketer turned politician Imran Khan is more popular than ever as the the country’s general election nears. Here's an in-depth look into his life. 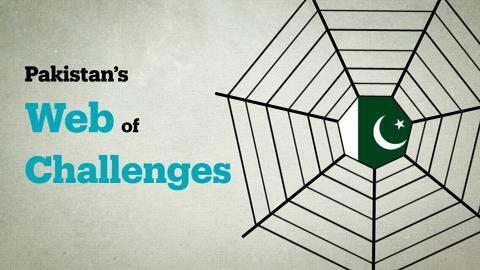 Can the Pakistani vote resolve the country's challenges? Pakistanis head to the polls to choose their government and leader for the next five years. Will the vote help bring in any change? In the southern Sindh province, where powerful feudal lords have decided the fate of elections for years, a new breed of politicians has come forward to upset the status quo. Has the Pakistani media been forced to skew and censor its coverage ahead of elections in Pakistan? Shahbaz Sharif, the brother of deposed Pakistani Prime Minister is now bidding to be PM as leader of the Pakistan Muslim League (N) party. He served three terms as the Chief Minister of Punjab province. In Pakistan, the centres of power haven't shifted much despite the political upheaval leading up to this year's elections. Can elections challenge the status quo? Low turnout has marred past elections in Pakistan. But with a new law mandating that at least 10 percent of voters have to be female, more women are getting ready to vote on July 25. The once-charismatic leader who could amass tens of thousands with one phone call has been completely sidelined in the 2018 elections. Pakistani politics has been experiencing many ups and downs since independence in 1947 with the power struggle between civilian and military leaders shaping the country’s political arena. Only three governments have completed their full tenure. In the upcoming July 25 general elections in Pakistan, thousands of candidates are taking part. Apart from politicians, some celebrities are trying their luck and vying for some important positions. What does Pakistan’s ‘war generation’ have to say about its elections? Pakistan currently has the youngest population it has ever had. Many from this demographic have been deeply affected by the issues surrounding Pakistan's 'War on Terror', especially those in the northwest of the country. What do they want? How fair is the democratic transition in Pakistan? The political leadership will have to work with the military to ensure smooth functioning of democracy, says think-tank. All signs pointed towards violence ahead of elections in Pakistan, but little had been done to protect election candidates. On the contrary, many were stripped of protection. When Pakistanis go to vote in parliamentary elections, there will be more women at the polls than ever before, but the level of participation will still be low as obstacles continue to hinder women's participation. Why are Ahmadis in a Pakistan town boycotting the election? Predominantly Ahmadi town of Rabwah in Punjab province is abstaining from voting on July 25 to protest laws that categorises Ahmadis as non-Muslim. They are part of the country's 500,000-strong community that self-identify as Muslim.